One of the most famous sites on the Blue Ridge parkway, this historical mill has a blacksmith shop. Locally owned and operated, clean and well-kept family lodgings in the heart of Hillsville, VA. Morning coffee and tea, ice and soft drinks are available in the breezeway. Cable T.V., a refrigerator, and a microwave are available in each room. 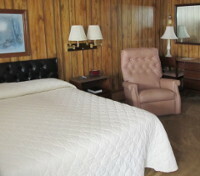 The larger rooms also include a recliner for added comfort. Rates: Single Occupancy: $60.00 plus tax. Double Occupancy: $70.00 plus tax. All of our rooms are no-smoking rooms. *Please note current rates as of January 1, 2015. Photo identification and credit card are required for check-in. Prior to arrival, please email vilaha12@gmail.com for any special requests, which may incur additional charges. Close to Martinsville and Bristol tracks, we are ideally located for NASCAR race fans heading to the track. Held in August each year, the Fiddler's Convention draws musicians and fans of country and mountain music. America's Most Scenic Drive runs through southwest Virginia near Hillsville. Visitors have a unique opportunity to see the region's history and natural beauty throughout the year.